It was a remarkably fitting end to the weeks and months of training. The last of the rollers lay behind me, and ahead was one long straight run down to the end of the road where the R315 meets the sea in the small coastal town of Yzerfontein. For the first time in the last fifty or so kilometers since parting company with Emmerentia and Henri on the outskirts of Malmesbury I could sit up and enjoy the stunning west coast scenery, bathed orange in the rays of the late afternoon sun dipping towards the watery horizon ahead. We had made a much faster time to Malmesbury, our 11:30am arrival was two hours sooner than I had predicted to Yoli. 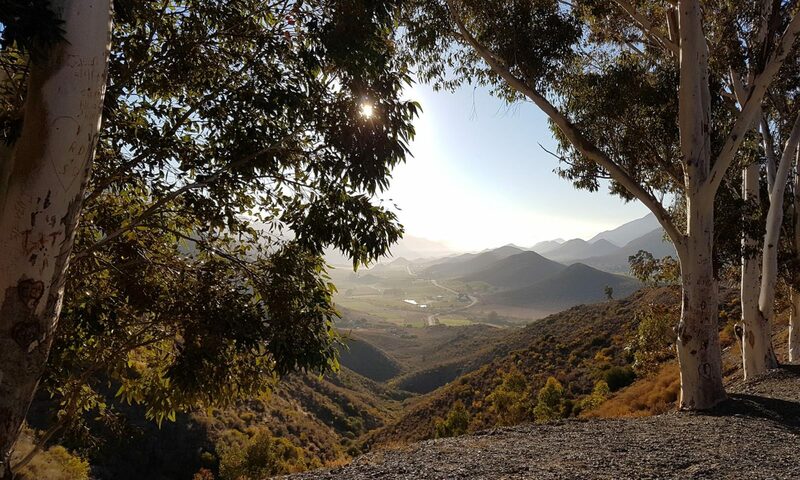 The strong northwester that was forecast had only materialized after our coffee stop in Hermon as we crested Bothmaskloof – perhaps we’d been sheltered by the low line of hills, or maybe it had just been slow to blow up. Either way, as a group of riders we’d been largely untroubled by the headwind we were expecting. But, as if to throw me down one last test before LEL, by the time we said our goodbyes and Henri and Emmerentia turned back towards Somerset West, the wind was now in full force. It was hard to enjoy the glorious rolling landscape when every rise of the road combined with the headwind to drag my pace back to a crawl, at times barely making 10 Km/h. Not knowing the road, and with nowhere to hide from the wind it would have been all to easy to become dispirited and simply stop – especially with the temptation of Yoli somewhere behind me in the car. Fortunately, the overriding lesson learned from the past long rides was how to keep going, one crank turn after the next. And sure enough, despite the slow pace, eventually the town of Darling came into view. Tired and sore from hunching over the handlebars, I slumped down and drained two quick coffees in succession – even adding sugar for extra energy, even though I don’t normally take it in coffee. It was a great relief to see Yoli’s smiling face as the last of the second cup went down. With just 25km or so to go, there was no way I was going to accept the offer of a lift – although I did welcome the offer of some supplies grabbed from the nearby Spa. Initially, the road after Darling was much like the stretch before, except even more undulating and potholed without the wide and smooth new tarmac surface. But after a couple of big rollers, there it was, the sea, the setting sun, and the end of my training for LEL. In Yzerfontein I swung left towards Pearl Bay and the beach house we were staying in. For one all too short kilometer I enjoyed the tailwind that Henri and Emmerentia would have enjoyed surfing all the way back to Somerset West. The final distance for the ride was around 180km, although it had felt much further. With the Sunday and Wednesday rides, the total for my last week of training was a rewarding 420km. It felt good to be able to relax as I sat soaking in the bath, beer in hand, and reflect on the great rides we had done, and the truly amazing winter weather and scenery we had been blessed with. I can't believe it is almost over now…. In a week you will be in the UK preparing and then only a few more days to start it all. It is going to be epic!! !